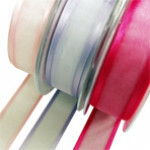 A beautiful organza ribbon available in widths of 16mm and 23mm finished with satin edges. Organza ribbon is very popular for weddings, used either to tie wedding favours or part of the invitation. All colours and widths of ribbon displayed on our website are held in stock here in the UK from our Coventry West Midlands head office, and our Skegness Lincolnshire warehouse. Please contact our sales team if you require a colour or widths not displayed. Chiffon is another name used for organza. Azalea Elegance Organza Ribbon Roll widths from stock either 16mm or 23mm 91 metres.. Lemon Elegance Organza Ribbon Roll widths from stock either 16mm or 23mm 91 metres ..
Orcid Elegance Organza Ribbon Roll widths from stock either 16mm or 23mm 91 metres .. Shocking Pink Elegance Organza Ribbon Roll widths from stock either 16mm or 23mm 91..
White Elegance Organza Ribbon Roll widths from stock either 16mm or 23mm 91 metres ..